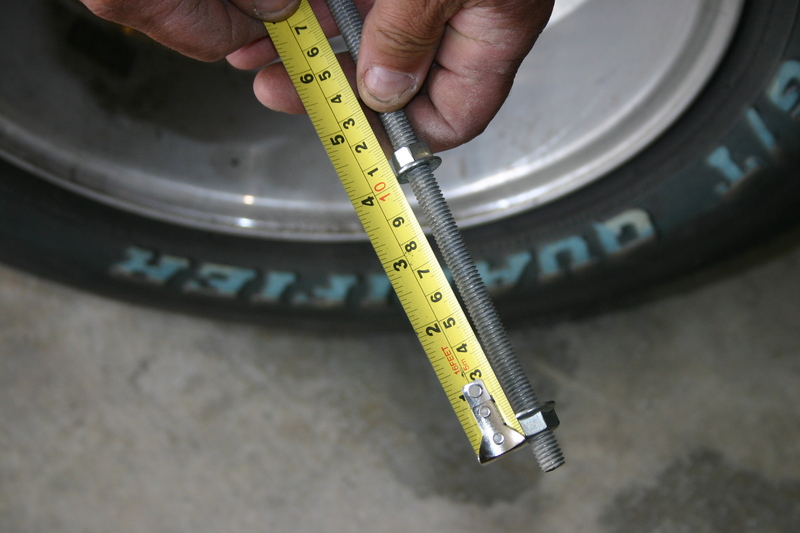 By using a very simple homemade tool, you no longer have to guess dimensions when it comes to selecting used or new wheel and tire sizes. I am currently employed as a Sales/Customer Rep at Total Cost Involved Engineering, a major manufacturer of street rod and truck chassis along with complete front and rear suspension options for Mustangs, Camaros, Novas and other muscle cars. Not a day goes by without a customer requesting help when it comes to fitting fat wheels and tires onto his special project. TCI supplies me with charts as a guide, but many of you are stuck with a huge dilemma, such as the case with a fellow truck club member. Here is one possible solution. My F-100 buddy, Bill Lee, had the chance to purchase a set of used wheels and tires for his F-1 project that would literally save him hundreds of dollars versus the purchase of expensive new ones. 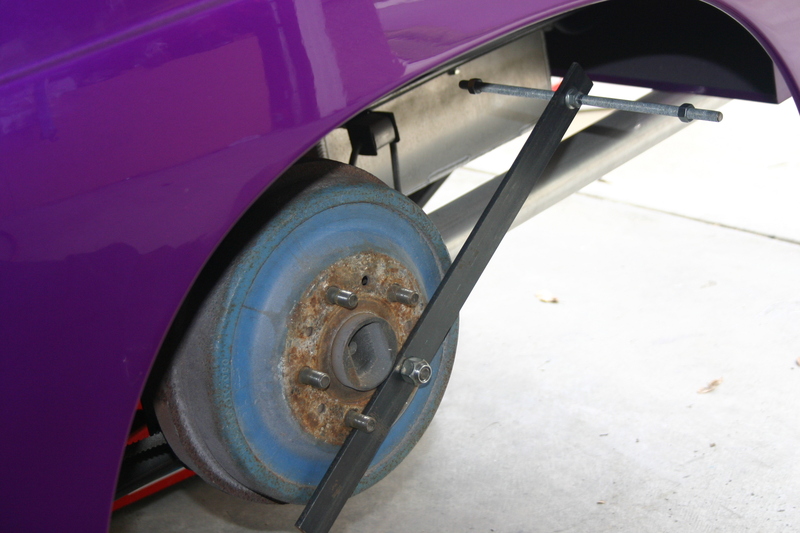 Bill had the opportunity to measure the wheels and tires, but how was he ever really going to know they would fit the truck without rubbing the fender lips or bed sides, especially since by the tape, they were extremely close? Lee had recently watched a tech at Bobco’s shop in Lake Elsinore, CA use a homemade tool to check the wheel fitment on a six-figure custom truck they were fabricating. 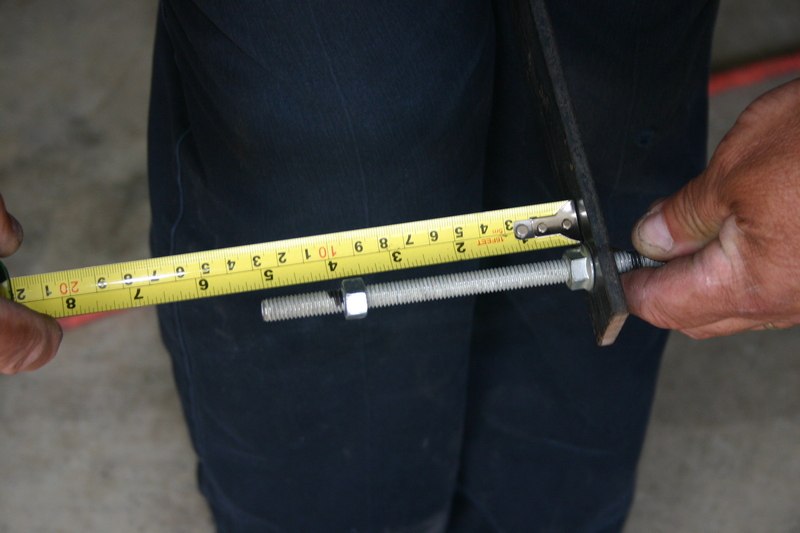 Bill borrowed Bob’s tool as pictured and proceeded to take maximum measurements of the wheels and tires that were for sale. With these measurements, Bill would actually know for sure they would then fit his truck without rubbing the fenders or bedsides. Follow along in the photos as we show you how it is done. 1-As you can see from this photo, the wheel /tire combo fit, but ensuring the bulging tires would actually fit between the bed and fenders was a chance Bill Lee wasn’t ready to gamble on. As you will see in the following images, some threaded rod and a stick of bar stock solved the mystery of whether these tires and wheels would fit the purple Ford F-1 truck without rubbing! 2-First order of business is to actually measure the true width of the wheels and tires. 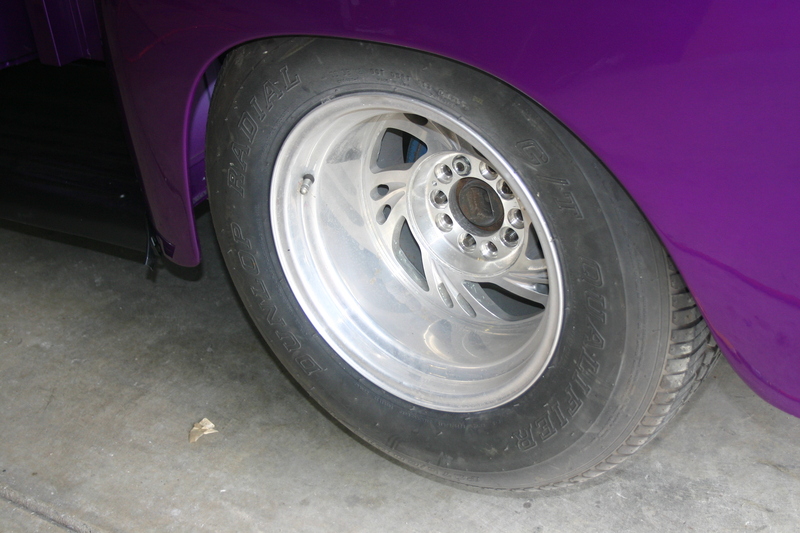 While the rear rims measured 10-inches in width, an additional one-inch had to be added to the measurement to allow for the tire’s sidewall bulge. He came up with an 11-inch width with the tires inflated. 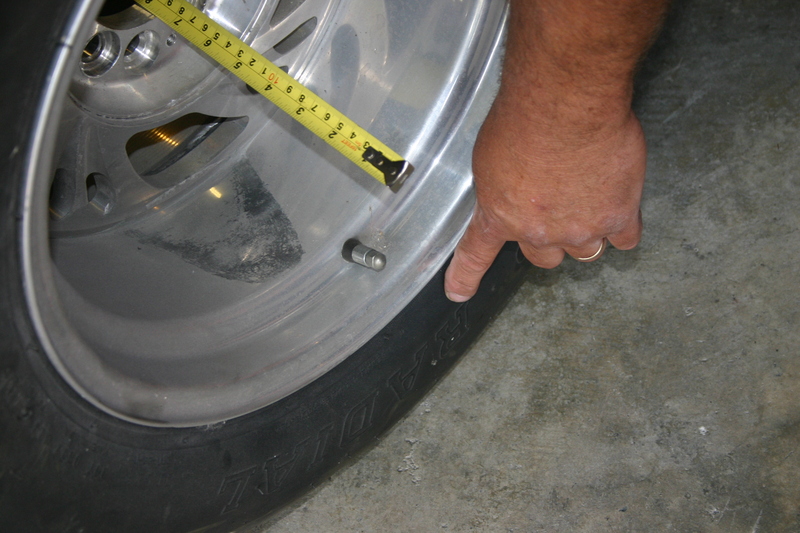 Back spacing (the distance from the wheel’s rim to the inside face) is also measured and recorded. 3-The tool. For less than $5 anyone can fabricate their own wheel fitment tool by purchasing a stick of threaded rod, four nuts and a section of flat bar stock. 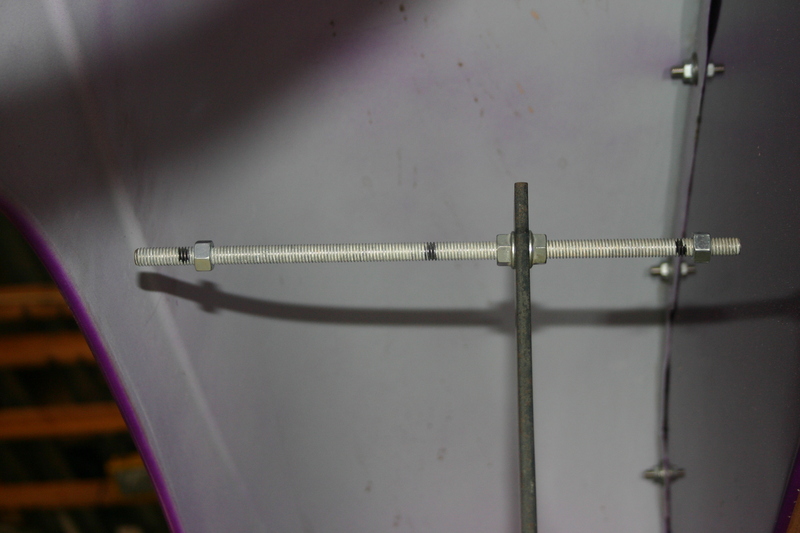 Drill two holes, one 1/3 from the end of the bar stock and one at the end as shown. 4. For the initial measurement, the 11-inch long threaded rod is centered with 5-1/2-inches protruding from each side of the bar. 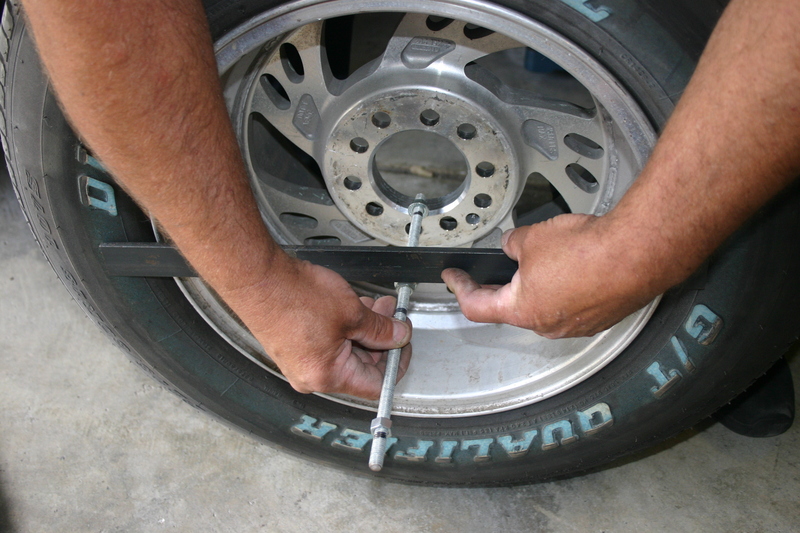 The inside nut is set at 4-inches indicating the spacing of the wheel center using the measurement taken earlier from the actual wheel. 5. 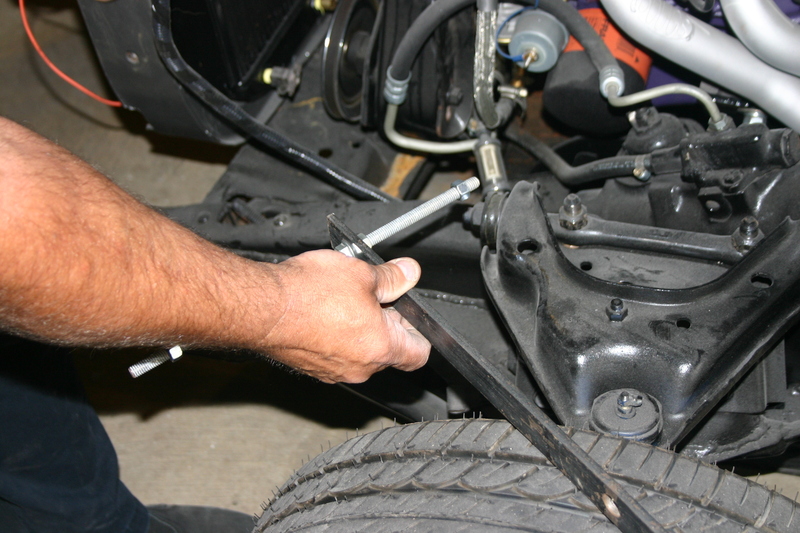 Using measurements taken from the wheel, the two jam nuts are used to lock the bar stock in place and a nut is positioned so that it is 4-inches out from the flat bar indicating the alloy wheel has a 4-inch back space. This nut’s placement with then be used to ensure the wheel will fit the truck. 6. With the truck secured on jack stands, this is an image looking from the floor up into the rear fender. As you can clearly see, the 10-inch rim, represented by the placing of the nut onto the threaded rod, will clear and so will the bulge of the fat tire as represented by the end of the threaded rod. Close yes, but it will clear. No guessing when it comes to clearing the inside of the bed and frame rails. Now, how about the fender lip? 7. Next we will measure twice and check twice to ensure the wheel back spacing is transferred to the threaded rod and again, indicated by the placement of the outside nut. We used a marker to ensure this measurement is again correct. 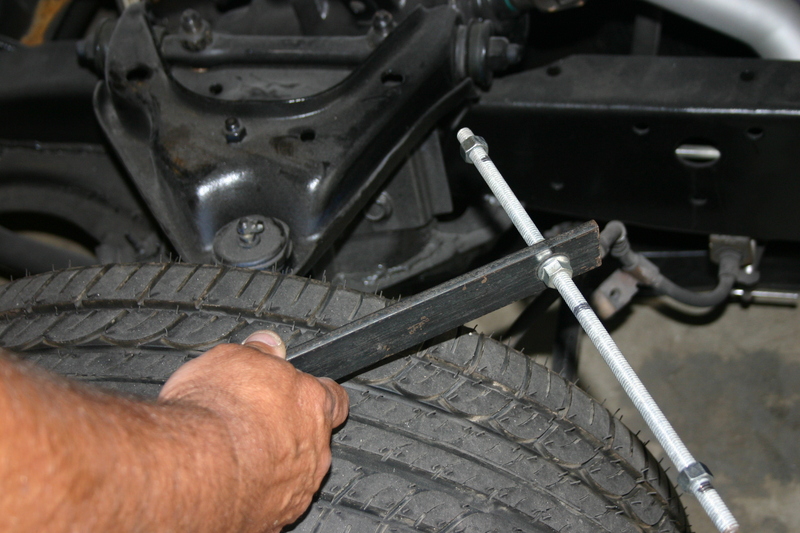 With a sharp eye, you can see Bill set the rod with 6 ½ inches on one side and 4 ½ inches on the other with is the overall width of the wheel and inflated tire. 8. 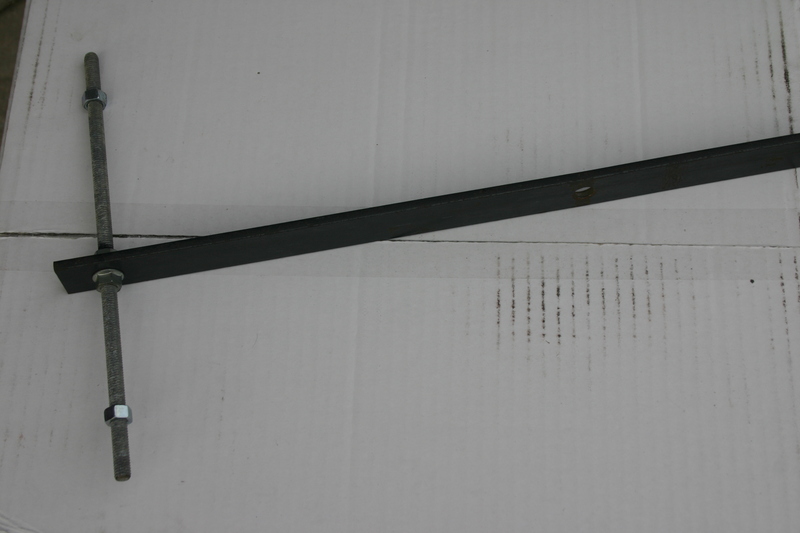 Once again the flat bar is mounted onto the brake drum and the rod is slowly rotated into position. We aren’t just lucky, but good as the wheel/tire combo with the unique off-set will clear with no problems. As a matter of fact, Bill has discovered that he can also position the wheels closer to the fender utilizing thin spacers if he so desires. 9. Next on the list is to check the front wheels and tires to ensure they also will fit the truck. Again, the overall width of the wheel and inflated tire are recorded along with the back spacing of the wheel. 10. 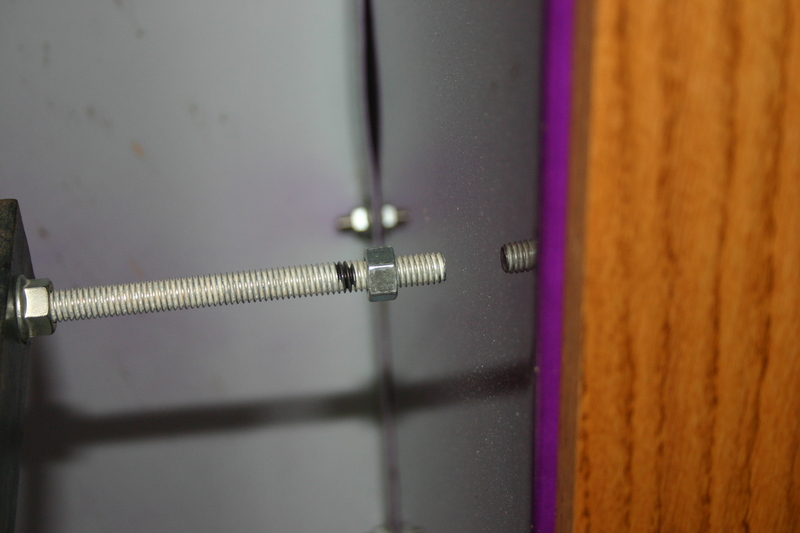 The wheel measurements are then transferred to the threaded rod and the nuts are set accordingly. Bill then purchased the wheels and tires knowing they would fit his F-1 truck without any question concerning fender or bed rub. Save some headaches and money. 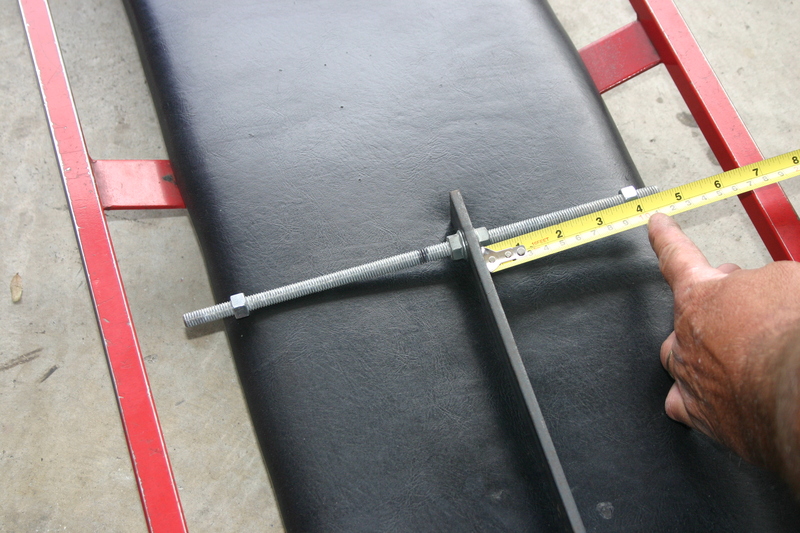 Build this wheel guide for your tool box. Special thanks to Bill Lee and Bobco’s for their assistance on this article. 11-The flat bar was installed onto the front brake studs and quickly established that there was plenty of wheel/tire clearance. Bill was quick to point out that these old trucks came with relatively narrow rims and skinny tires, so another consideration is to check for clearance when the wheels are turned lock to lock, right to left.